Mad Max perhaps invented the reboot. 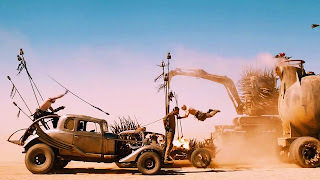 One of the most interesting things about the Mad Max films is the way in which the backstory has changed from film to film. Nuclear war is not even mentioned in the introductory voice over of The Road Warrior only to be included in the backstory of Mad Max Beyond Thunderdome. Mad Max: Fury Road changes the backstory as well, adding "the water wars," to the blood and fire that have made the apocalypse. 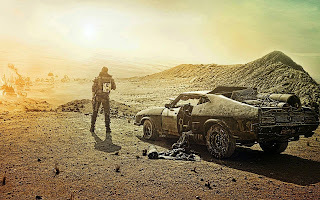 It is possible to argue that each film reflects changing nature of apocalyptic fears, from gasoline shortages, to nuclear war, and finally to dwindling water supplies. We get the apocalypse we fear. It is difficult to place the film in any linear continuity with the previous films. Max still has his Interceptor at the beginning of the film, but it is destroyed as it was in The Road Warrior. This difficulty to construct any linear order has everything to do with the film's will to franchise, to make Max the next James Bond--replacing the actor and continuing to make movies that are less sequels in succession than variations on a theme. Despite this lack of any discernible linear progression it is possible to chart the film's progression on at least two points, that of social reproduction and subjectivity. At the level of social reproduction the Citadel is comparable to Bartertown, an emergence of a new social order from the ashes of the old. Both films thus take place after The Road Warrior. Thunderdome's Bartertown was a city desperately trying to establish itself. Its primary institutions concern the law and the system of justice, "Two men enter, one man leaves" and "Bust a deal and face the wheel." The law primarily serves to regulate conflict, and always risks collapsing back into the conflict that it regulates. In contrast to this we learn very little of the Citadel's legal structure. We learn that Immortan Joe controls the water supply, and uses this power to dominate reproductive life. The film skips over the entire legal system proceeding directly from the economy to religion. 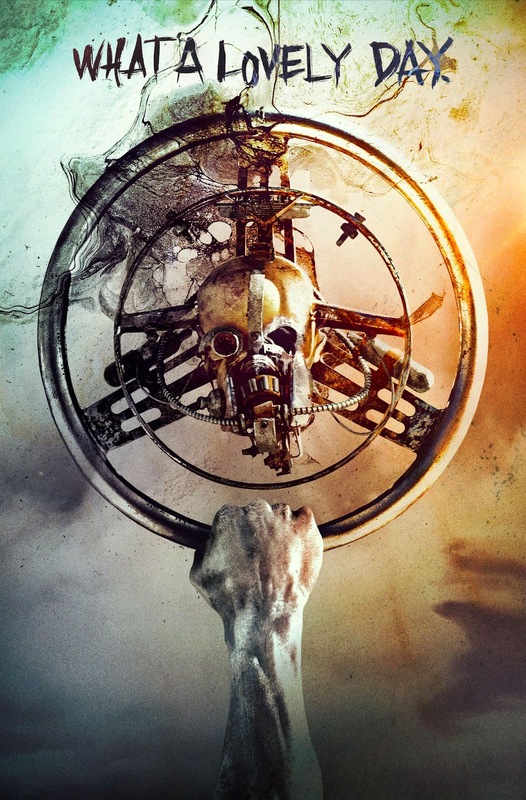 The "warboys" of the citadel have an elaborate religious system that begins with iconography of the skull, Joe's symbol, to end with its own idea of the afterlife. Warboys who die in the service of Immortan Joe ride the roads of Valhalla forever. From cradle to grave the entire lives of the warboys is filled with symbols, from "mother's milk" to their shiny and chrome grills. The religion is rigorously, even ridiculously, patriarchal, passing from father to son and leaving women out entirely; they are objects not subjects of the law. They are the conditions or reproduction of life, not unlike water, not subjected to power. Hence their slogan of rebellion, "We Are Not Things"
The progression from Bartertown to the Citadel is a progression in the development of political power, from the Repressive State Apparatus of laws and conflicts to the Ideological State Apparatus of ideas and subjection. It is a progression in which the techniques of social reproduction are expanded and extended, as Spinoza writes, “the multitude has no ruler more powerful than superstition." At the level of post-apocalyptic social history Fury Road is then after Thunderdome. The former gives us a city establishing law in the face of violence and chaos, while the latter gives us a city that has expanded its superstructure beyond law to encompass religion, even culture. It is a religion that dictates not just belief in a afterlife but clothes, hair, tattoos, and even a symbolism of the teeth and chrome (my favorite touch) To cite Spinoza once again in a passage that could apply to Immortan Joe as much to Moses, “…he did not allow these men, habituated as they were to slavery, to perform any action at their own discretion…They could not even eat, dress, cut their hair, shave...or do anything whatsoever except in accordance with commands and instructions laid down by the law.” The law no longer deals with infractions, but constitutes the very existence of social life. A similar progression can be found at the level of subjectivity, specifically that of Max. In the Road Warrior Max was a loner, dictated and driven by his own self interest. His relations with others are entirely determined by contracts; first a contract with the survivor of the colony's scouting party, then a contract with the entire colony to procure a "rig big enough to haul that tanker." The entire film is an adventure in pop-Hobbesianism, of a world of contracts without a sovereign to enforce them. Betrayal is a constant risk. Fury Road presents a different Max, driven less by interest than by pure survival, something more immediate and elementary. In each film Max eventually negates and sublates his own self interest, risking his life for the good of others, but there still is this difference between the films from interest to survival. The earlier Max negotiated and strategized, the latter Max runs, fights, and runs again. This is in part conveyed by the different actors. Mel Gibson's Max was taciturn, but could negotiate if the situation required it. Tom Hardy's Max is practically non-verbal, grunting as much as speaking. It is also conveyed by the construction of images. The Road Warrior is very much a film of what Deleuze would call the movement image, not just in terms of its overall logic which follows the classical western or samurai film in the movement from situation to action to situation, the build up to the big chase and confrontation, but in the constant interplay of actions and reactions, situations and close ups. Think of the opening chase, or the final crash with the bullet on the hood of the truck. The Road Warrior is a film of actions and reactions, but they are mediated, interrupted, by a moment of affect, thought, or reflection. Max eyeing his adversaries on both sides before slamming on the brakes, Wez seeing the truck in horror before slamming into it, and so on. Even the dog and the snake get a close up. Fury Road is a very linear action film, and has been rightfully seen as a departure from the chaos cinema of Michael Bay and others. However, as much as the action is presented with clear lines of escape and conflict they pass less through the close-up, through the moment of thought, than through a much more immediate logic of action and reaction. There is no time or space for thought. Attack, defend, attack defend, explode. It is not a cinema of the brain, but of the reflexes. This then is the way in which Fury Road can be seen as a progression, a sequel, to the earlier films. Society, the social order, has become more encompassing, constituting a religion and not just a law, while subjectivity, especially that of those outside the social order, has become more immediate, more driven by survival. Every society gets the post-apocalypse it deserves. Thank you for your time and thought on this review.